For the last leg of this absolutely packed nine-day journey, the trains led down along the Mediterranean Sea and then more or less hugged the coast all the way to Barcelona. 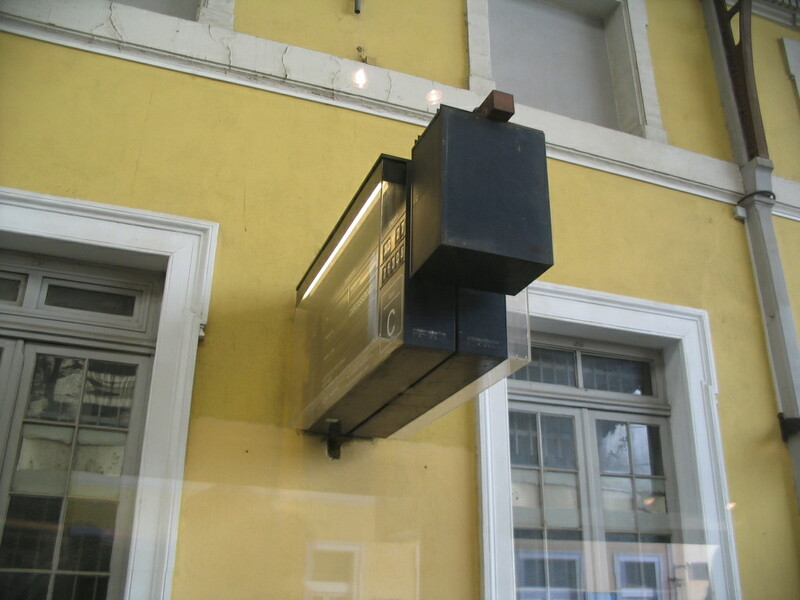 The platform display at Avignon just after boarding the train. 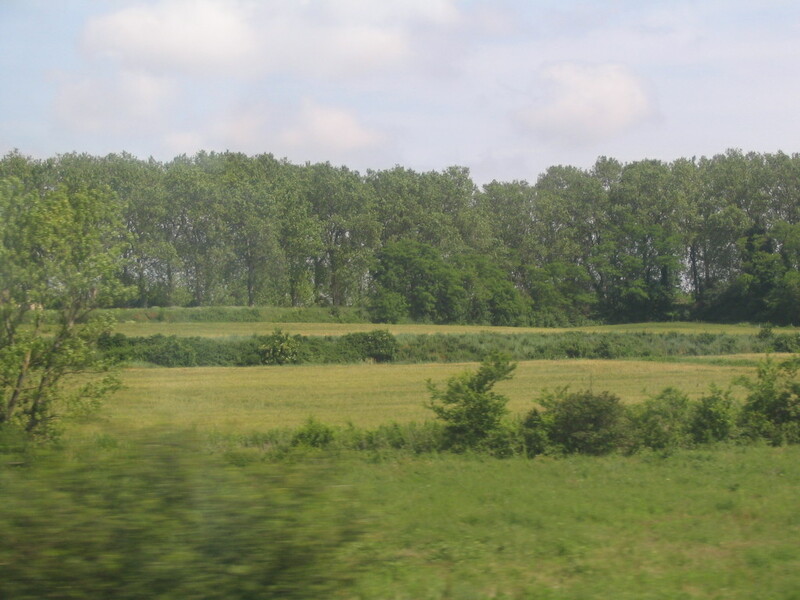 Luckily, unlike the previous day's uncomfortable rides, this train was air conditioned and spacious. 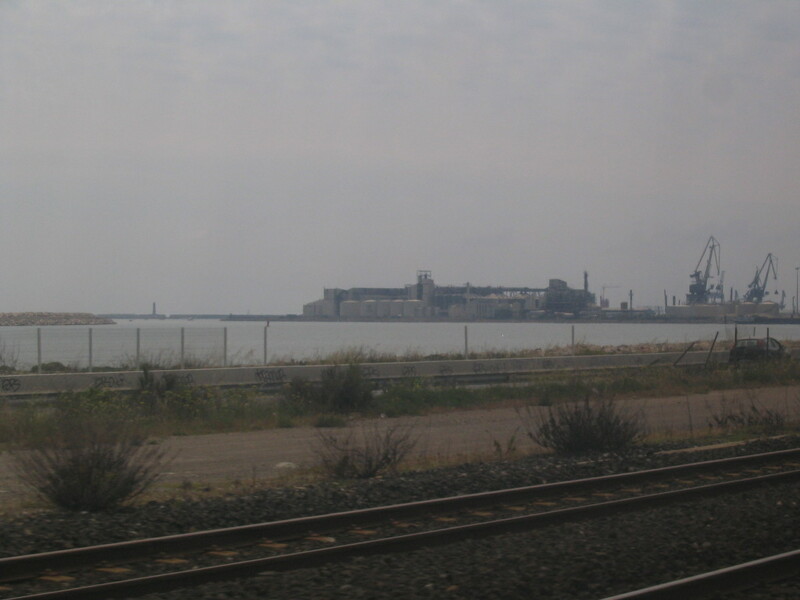 While crossing the Rhône, a familiar sight by now: une rangée d'éoliennes. 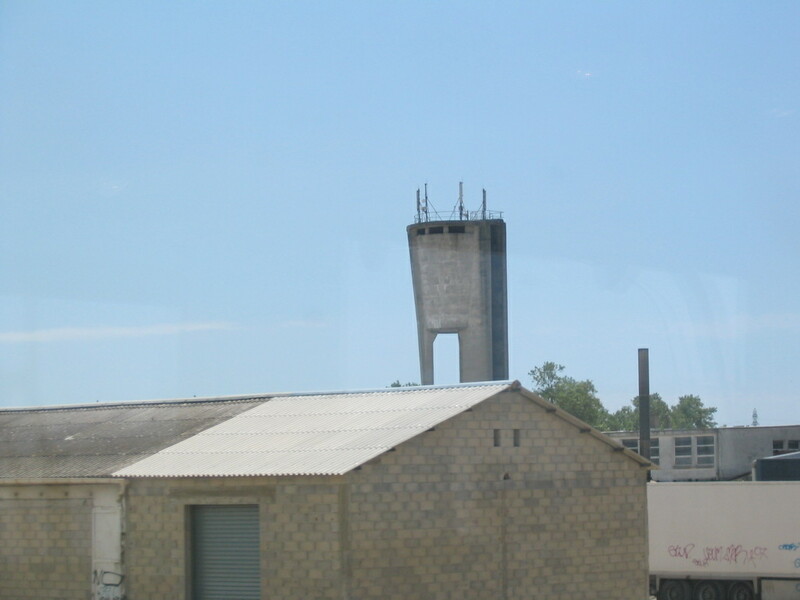 Near Lunel: an oddly militaristic water tower? 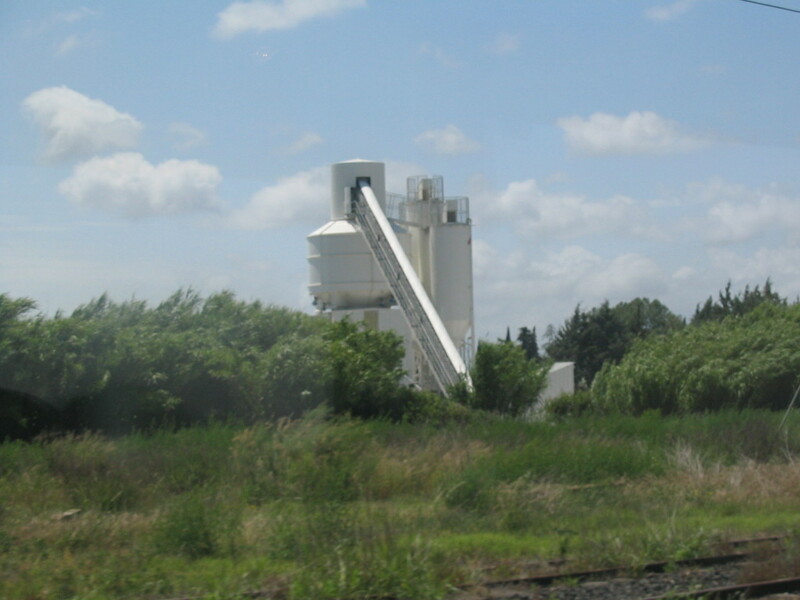 And a food-processoresque silo complex. 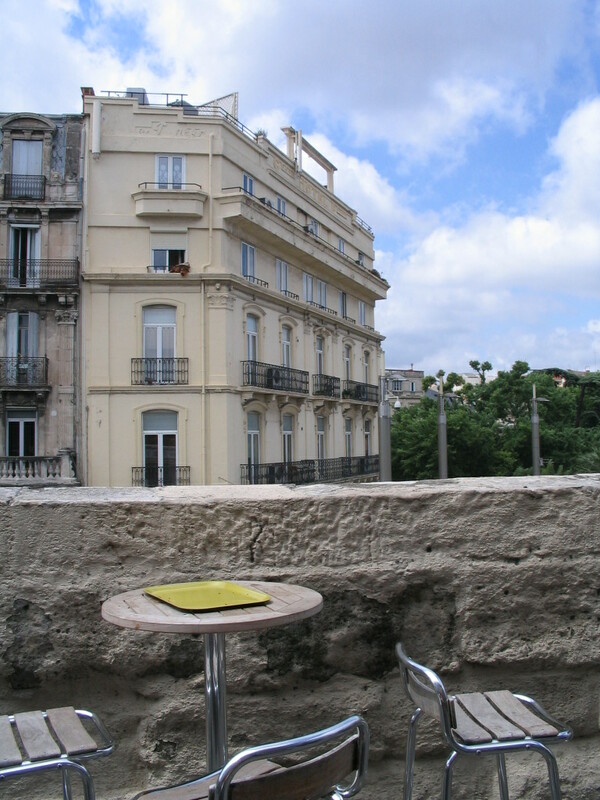 At the Gare St.-Roch in Montpellier, I transferred to a Spanish RENFE train to continue the rest of the way. First though I lunched on this narrow terrace on the upper level of the station. 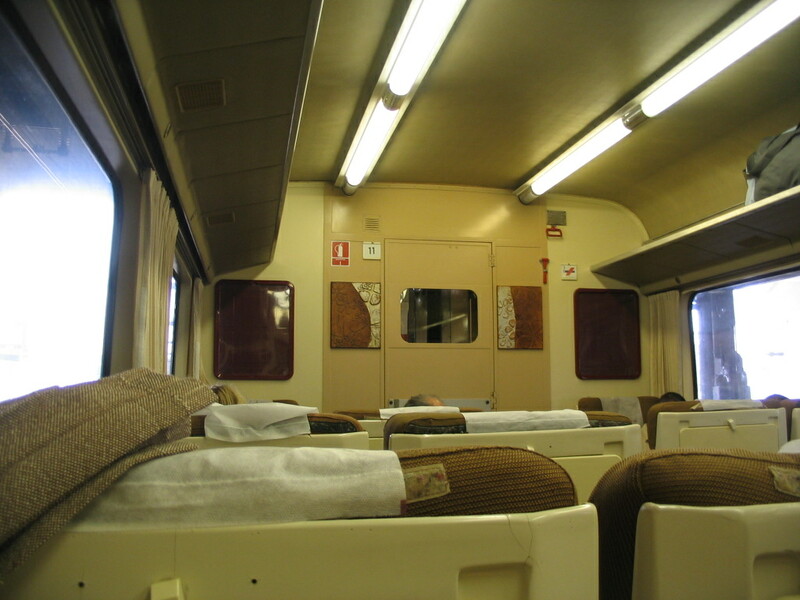 The new train was also pleasant despite its cream-of-mustard ambience. 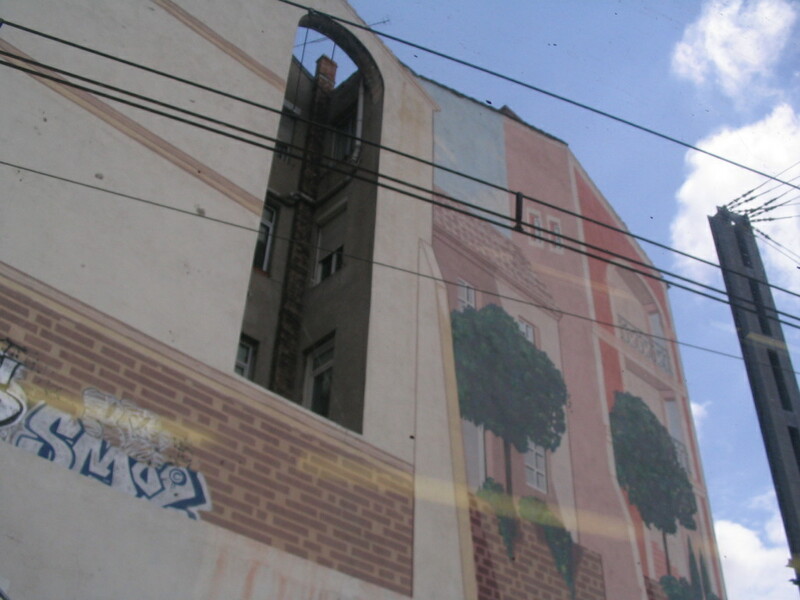 Still by the Gare in Montpellier, some intriguing quasi-trompe-l'oeil. 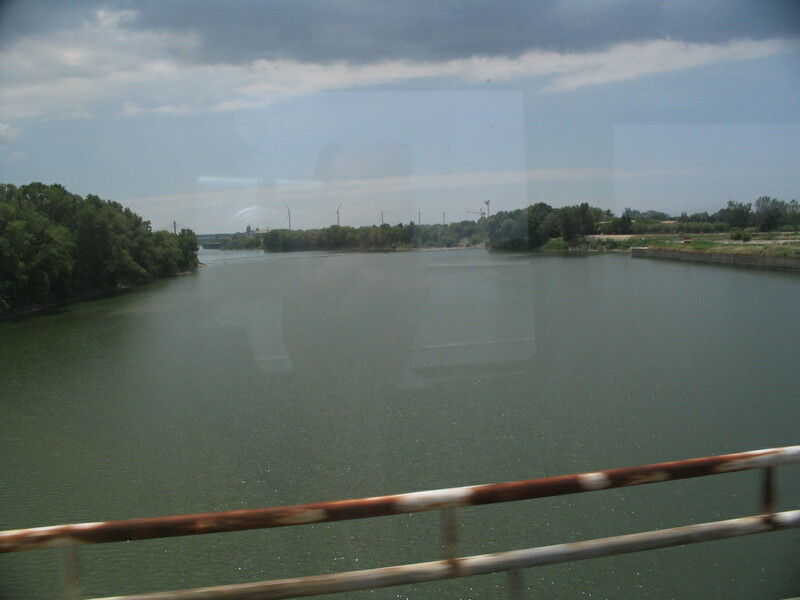 Soon thereafter was my first-ever glimpse of Mediterranean waters! Backwaters, but waters nonetheless. 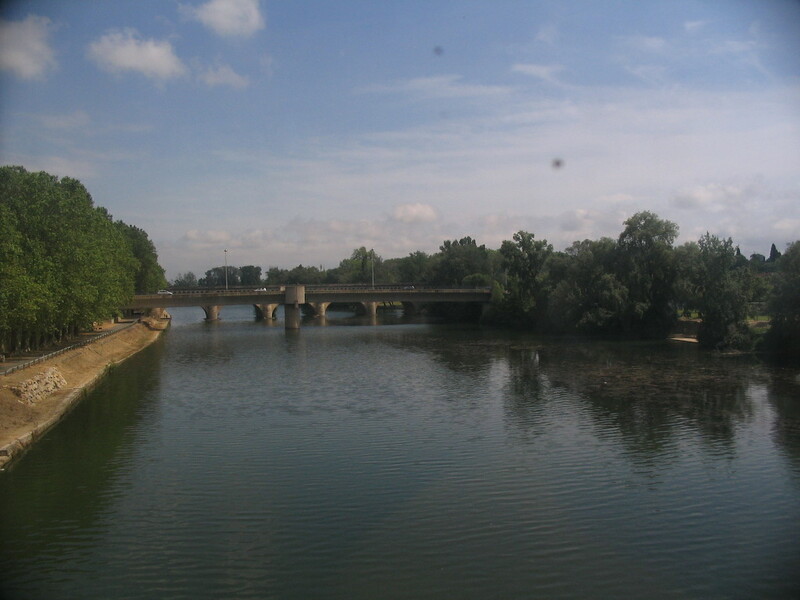 This is maybe the Étang de Vic. 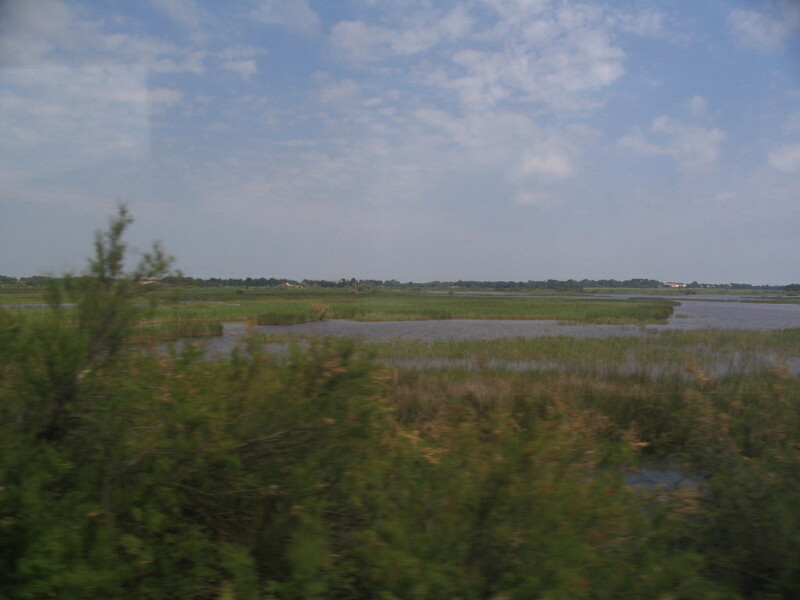 I didn't really realize before seeing this landscape firsthand that much of the French Mediterranean shore is so marshy — I had always pictured it as being kind of mountainous, but of course that's mainly just where the Alps and the Pyrenees meet the sea. Whoa. 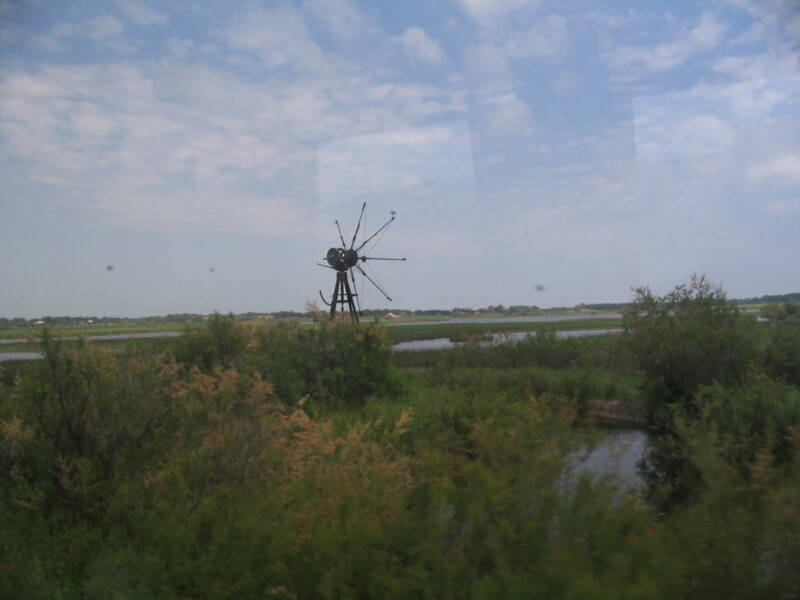 This windmill is straight-up steampunk. An oil...facility. I'm not really up on my oil facility terminology. 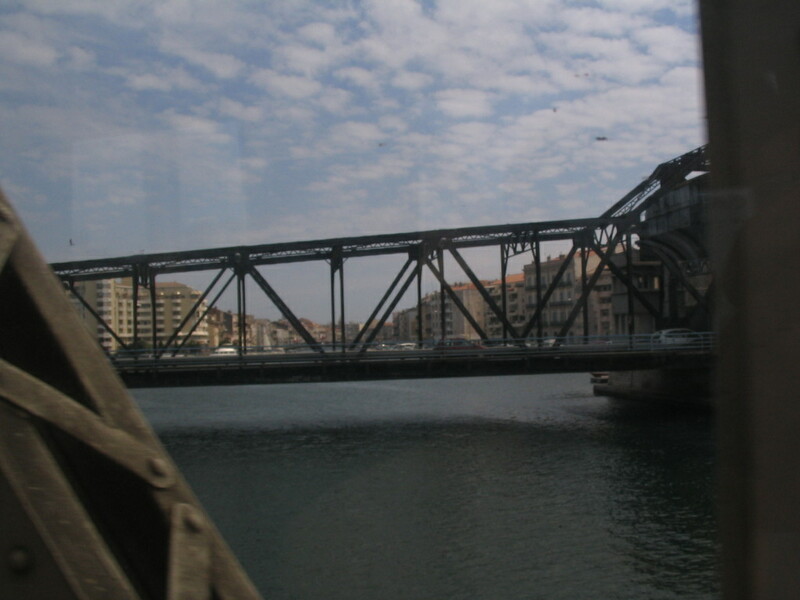 Crossing a canal of the uniquely situated city of Sète, perched between the Étang de Thau and the Mediterranean at the foot of Mont Saint-Clair. 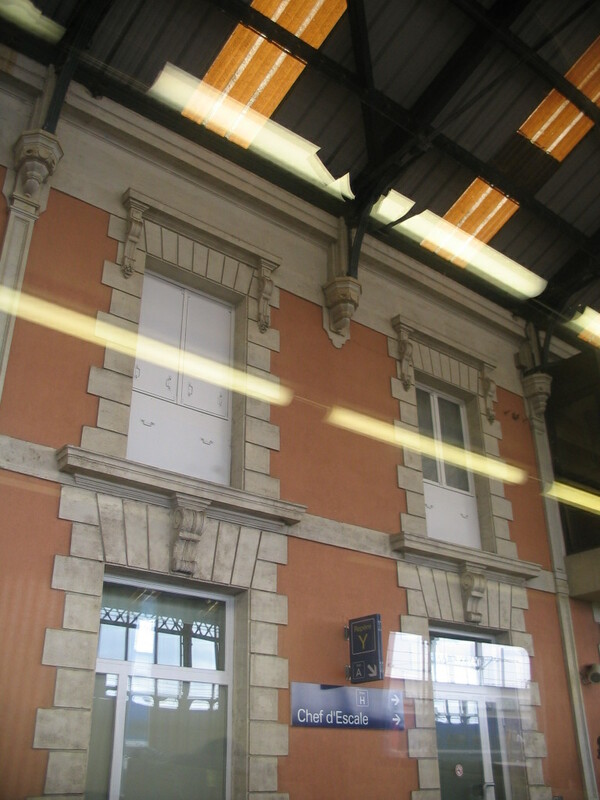 The station at Narbonne has a similar setup as that of Avignon: a masonry core with a light metal trainshed. 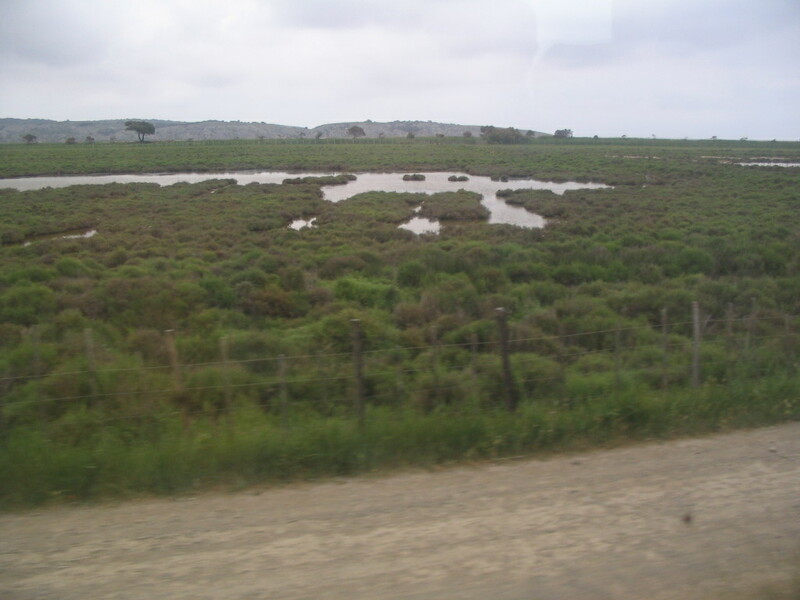 After that the route threaded between lagoons through a regional park, the Parc Naturel Régional de la Narbonnaise en Mediterranée. Here the trees at the apparent edge of the flat seem to be mysteriously evenly spaced. 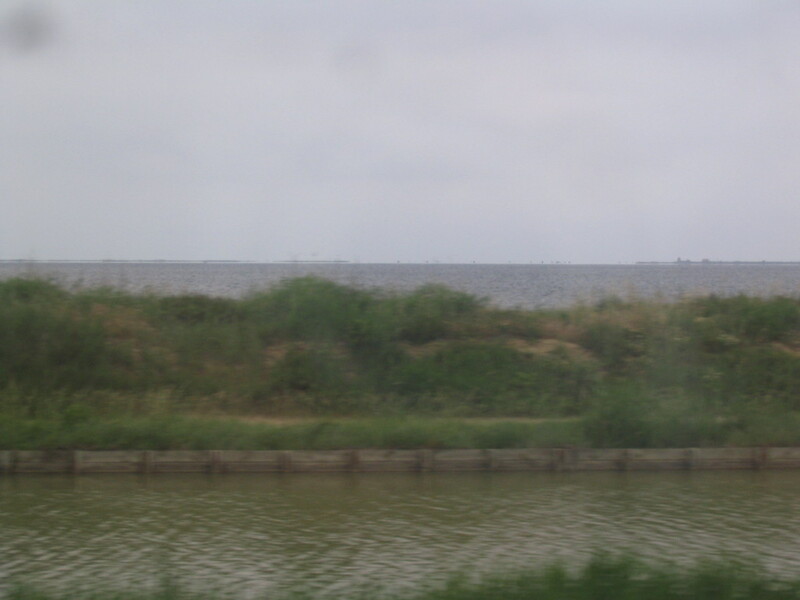 This Étang was wide enough to mirage-float the barrier lands beyond, recalling some Utö scenes. 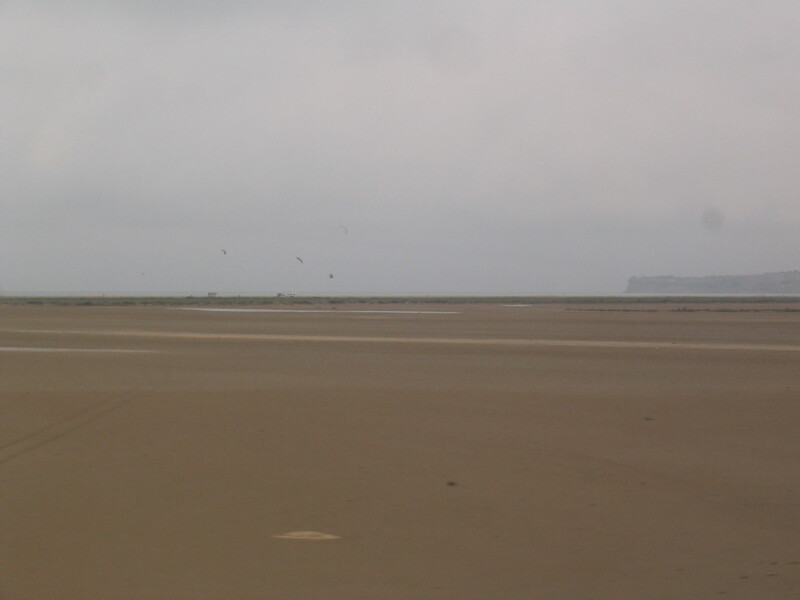 An almost-infinite beach and the apparition of a cliff. 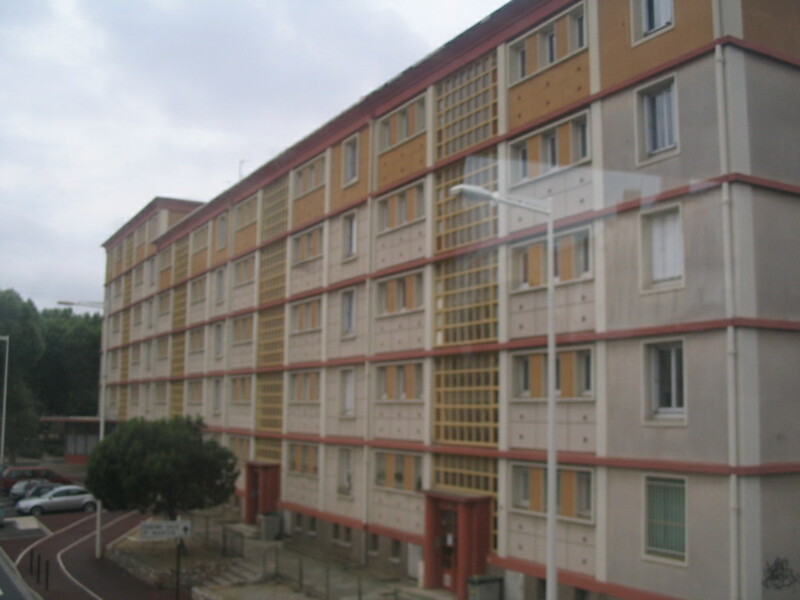 At Perpignan, probably: this is one of the more colorful large housing blocks I've seen. The variation in textures is also a nice effect.